Many of the addicts actually feel relieved to be able to let their parent or spouses know just how bad their prescription addiction has gotten and want to be in a safe environment when they finally ‘come clean’ about their usage. Narconon Florida’s Executive Director, Cheryl Alderman, reports seeing a new trend appearing as parents enroll their children in the Narconon drug-free program. Of the parents present during the initial intake interviews, 95% had no idea of the high and potentially lethal daily drug doses, many prescription drugs, their loved one was taking. Over time people addicted to drugs build up a tolerance for the substance they are taking and as they continue to use the “Highs” are less high and they must take more drugs just to not be in pain or withdrawal. “Routinely, people addicted can take 25-30 Oxycontin daily, along with 4-5 Xanax bars and much more on a daily basis. Many say they wake up and roll over in bed to do a line of Cocaine just so they can start the day,” says Alderman. Not knowing how truly addictive prescription medications can be and having them so readily prescribed in Florida has dramatically increased the amount of prescription drug users seeking withdrawal and rehabilitation services. This trend is also bearing out in the intake reports Alderman sees on a weekly basis at her Narconon Florida center in Clearwater. With many years of experience in drug rehabilitation she says they are seeing prescription drug addicts forming 95% of their new “students” as they call people on their program. The prescription addiction starts one of several different ways, treatment for an injury, a dental procedure or someone gives them something to feel better and get them through a tough time, or just a little something to pump them up at a party, but no matter what the path of addiction is, it leads to higher and higher does and to the same life ruins: loss of jobs, family, health and more times than not, loss of life. “In Pinellas County we are losing on average 7-8 people to Oxycontin deaths a week. That statistic alone should make you very cautious of using prescriptions for any more than the recommended time and dose,” says Alderman. Families who have a loved one that may be suffering with addiction are invited call the center at 888-968-2124 for free information on prescription drug addiction or a confidential assessment. If the addiction has progressed to a point where treatment is needed, counseling and out-patient services are available at Narconon Florida seven days a week. 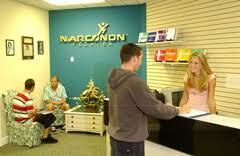 The Narconon program is unique from other drug rehab programs with it steps that are entirely drug-free; that is, the Narconon drug rehabilitation program does not use drugs or medications to solve the problems caused by drugs, but does use nutrition and nutritional supplements as an important component of its delivery. Thus the program is neither a psychiatric nor medical, but a social education model of rehabilitation.